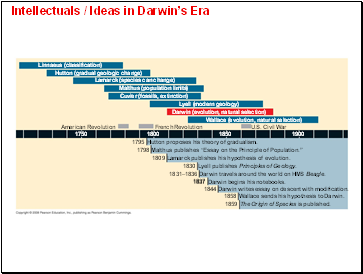 A new era of biology began in 1859 when Charles Darwin published The Origin of Species which focused biologists’ attention on the great diversity of organisms. Darwin noted that current species are descendants of ancestral species. 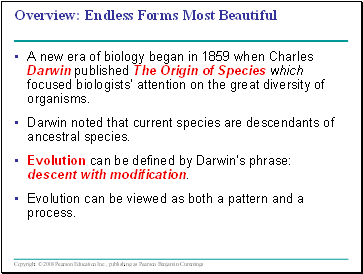 Evolution can be defined by Darwin’s phrase: descent with modification. Evolution can be viewed as both a pattern and a process. The Origin of Species is published. Wallace sends his hypothesis to Darwin. Darwin writes essay on descent with modification. 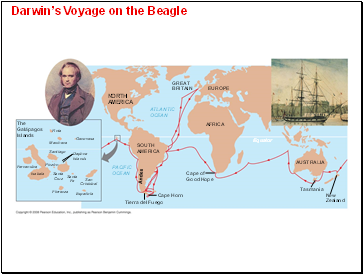 Darwin travels around the world on HMS Beagle. Lyell publishes Principles of Geology. Lamarck publishes his hypothesis of evolution. Hutton proposes his theory of gradualism. Carolus Linnaeus was the founder of taxonomy, the branch of biology concerned with classifying organisms. 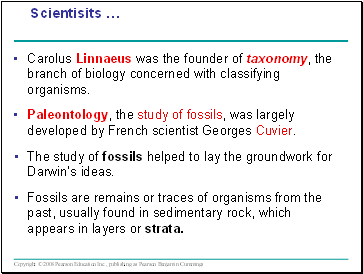 Paleontology, the study of fossils, was largely developed by French scientist Georges Cuvier. The study of fossils helped to lay the groundwork for Darwin’s ideas. 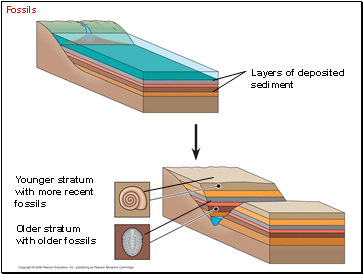 Fossils are remains or traces of organisms from the past, usually found in sedimentary rock, which appears in layers or strata. 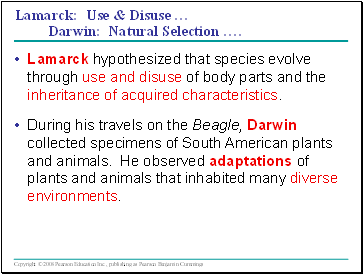 Lamarck: Use & Disuse … Darwin: Natural Selection …. Lamarck hypothesized that species evolve through use and disuse of body parts and the inheritance of acquired characteristics. During his travels on the Beagle, Darwin collected specimens of South American plants and animals. He observed adaptations of plants and animals that inhabited many diverse environments.